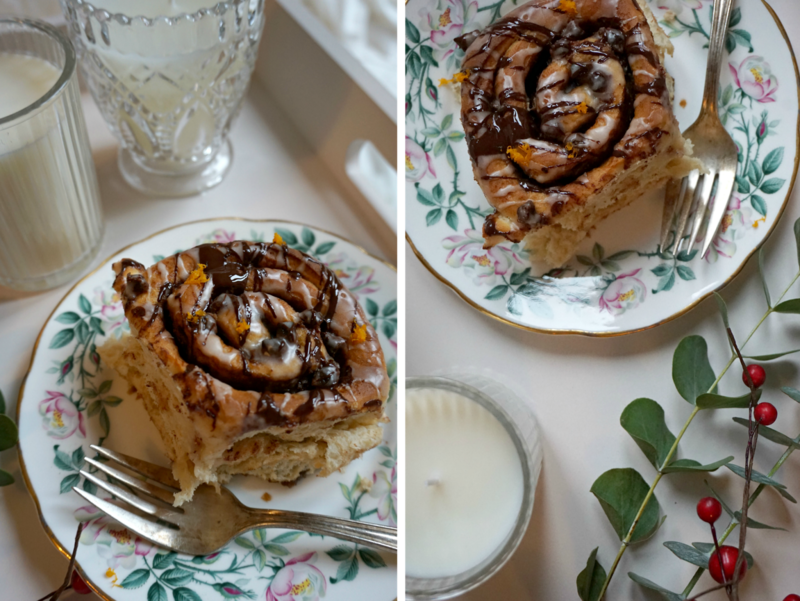 I while ago I shared with you my go-to cinnamon roll recipe, and I thought for Christmas I'd change things up a bit and add some of my favourite festive flavours; chocolate and orange. 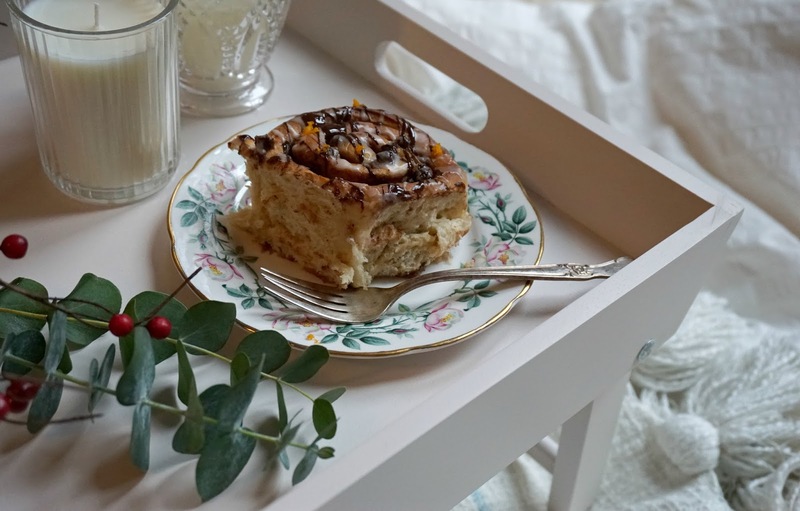 I always associate Terry's Chocolate Orange with stockings and present opening, so adding this flavour to my number one sweet treat is festive perfection! 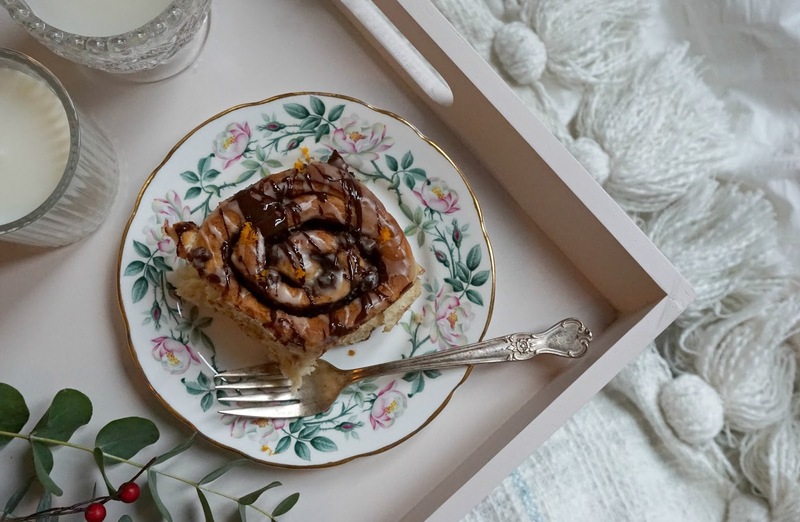 The good thing about this recipe - aside from the fact you're left with soft, cinnamon deliciousness - is it doesn't require anything particularly fancy ingredients-wise, and it's pretty much fool proof. Which, when you're juggling gift buying, Christmas parties and festive cheer aplenty, is so welcome. Baking dish approx. 13 x 10 inches. Warm the milk in a pan - don't boil - before adding the butter to melt. Take off the heat and leave to cool slightly. In a large mixing bowl, add 335g of the flour (put the rest aside), the yeast sachet, caster sugar and combine. The add the water, egg and the milk/butter mixture and beat well with a wooden spoon. Add the remaining flour (you should have 190g left) a bit at a time, mixing well with your hands. It should start to get harder and harder to mix as it comes together. Place on a floured surface and gently knead for five minutes. It should spring back up to the touch. Cover with a damp cloth whilst you make the filling. Melt the butter, and leave to cool slightly. Zest your orange. Weigh the sugar and mix in the ground cinnamon. Roll out the dough on a lightly floured surface, approximately to the size of your baking dish. 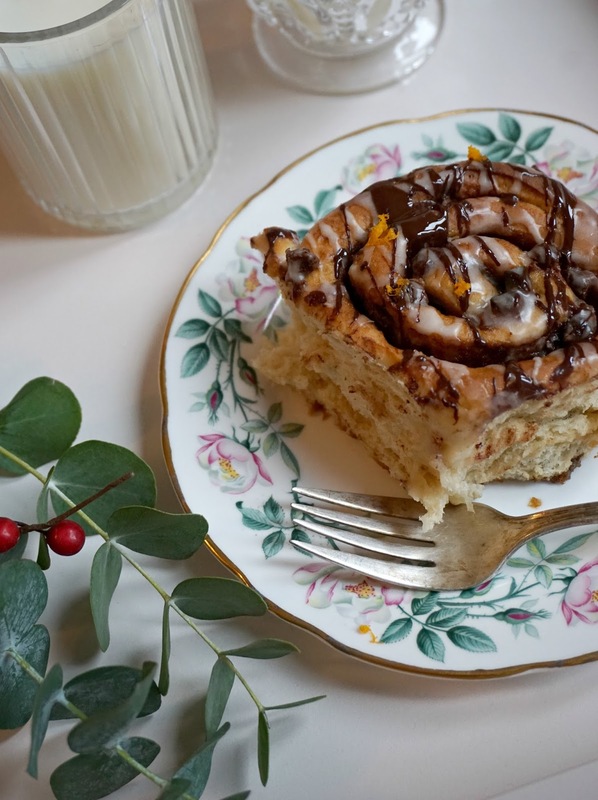 Using a pastry brush, distribute the melted butter and then sprinkle over the sugar and cinnamon, followed by the orange zest and chocolate drops. Roll the dough length-ways, and pinch the seam together. Cut in to twelve equal sized slices and place in to the baking dish. Cover with a tea towel and leave in a warm place to proof for 30 minutes. I warm my oven to 100c, turn off, and leave in there! Once proofing finished - they should have doubled (ish) in size - pop in your oven at 180c and bake for around 20 minutes or until golden. Leave to cool for a while before icing. Beat together the icing sugar and orange zest, and add warm water until you get a slightly runny consistency. Drizzle over the cooked rolls. Finish with a drizzle of melted chocolate for good measure. They taste best warm, so get to it!